Here’s my favourite tiny thing of the week: plant spores that leap and dance. 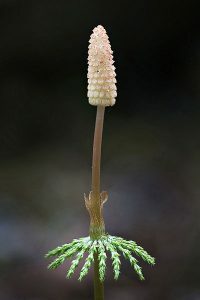 Philippe Marmottant of the University of Grenoble, France, and his colleagues used fast microscopy to reveal that horsetail spores have a cunning dispersal method. Each spore consists of a spherical body with four spindly legs. In humid conditions these legs wrap tightly around the body, but in dry air they spring open. If the environment cycles between wet and dry this allows the spores to change direction or walk, or even to leap back into the air to catch the wind. The study is published in Proceedings of the Royal Society B. It’s a neat system but what I love most is this video, in which Marmottant’s exquisite musical timing brings the spores’ dance to life. Pure joy.